Mazinger-Z vs General of Darkness is a pretty good passing of the torch. Mazinger Z is an undeniably iconic figure when it comes to the history of anime, one of the first pilotable mecha, cementing and popularizing many of the tropes that are still used 40 years after its inception, the way it was introduced in-series goes to show just how powerful the unit was by it being this unstoppable demon. Now imagine if this titan of power and fame gets absolutely demolished. The forces of the General of Darkness destroying the cities that Kouji worked so hard to protect sets up well just how helpless the Mazinger will be in this fight. It's honestly disheartening seeing its wide arsenal be useless against the villains: his rocket punches being deflected, his breast beam barely scratching, his missiles almost ineffective, his breath rendered null. seeing the damaged robot head into battle only to have his wings melted and limbs torn during the fight feels like watching a legacy come to an end. In this moment of total despair comes in the one who will take over the title of the demon that fights to protect the world: Tsurugi and the Great Mazinger. 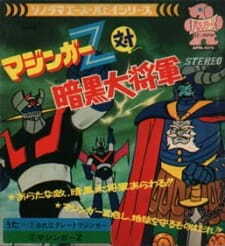 Demonstrating how the new unit is an objectively better version of the old one in all regards is a great way to convince the viewer that the Great Mazinger is fit to replace the current protector of the world, and having him work alongside the beat-up Z is a touching method of show that it has good intentions. Great's upgraded weaponry decimating the foes is an incredibly reassuring scene, considering just how hopeless most of the movie was, not only did it convey how Kouji would be ok leaving Tsurugi with his role, but it works well convincing the viewer that the new protagonist is someone they want to watch. If anything, this movie's a fun watch to see something that anime doesn't do as much anymore: an anime icon passing the baton to a new generation.